Hundreds of people filled Anchorage Baptist Temple on Wednesday to pay their respects to former Alaska Sen. Ted Stevens. (CNN) - Hundreds of people filled Anchorage Baptist Temple on Wednesday to pay their respects to former Alaska Sen. Ted Stevens, who was overwhelmingly remembered by speakers at the service as a man who embodied the state. "From the eerie silence of the tundra to the swish of dogsleds in the snow ... these things more than describe Alaska, they define a way of life, and no state has ever had a more fierce defender of that state's way of life than Ted Stevens," said longtime friend and former Senate colleague, Vice President Joe Biden. Stevens, 86, and four others died August 9 when the plane in which they were flying crashed into the side of a mountain in remote southwestern Alaska. The last U.S. brigade combat team has left Iraq. 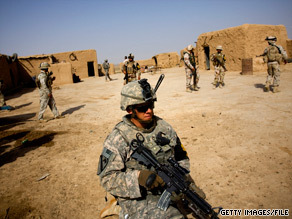 Mosul Iraq (CNN) - The last U.S. brigade combat team has left Iraq, leaving 56,000 U.S. troops in the country, according to the U.S. military. The 4th Stryker Brigade, 2nd Infantry Division's departure across the border into Kuwait comes more than seven years after U.S. combat forces entered in Iraq, though it does not signify the departure of all U.S. combat forces in the country. Another 6,000 U.S. troops must leave Iraq to meet President Barack Obama's September 1 deadline for the end of U.S. combat operations in the country and the beginning of Operation New Dawn. 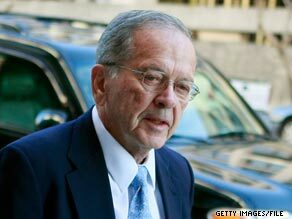 Washington (CNN) - Former Alaska Gov. Sarah Palin has already donated $2500 to try and help defeat Senate Majority Leader Harry Reid, D-Nevada, and talks are underway for the 2008 Republican vice presidential nominee to appear on behalf of GOP Senate candidate Sharron Angle. Jarrod Agen, Angle's spokesman, said that the Nevada Republican nominee's campaign is working with Palin aides to try and schedule an event before Election Day. "We are obviously happy to have her support and we are working with her team to get the two of them together," said Agen. 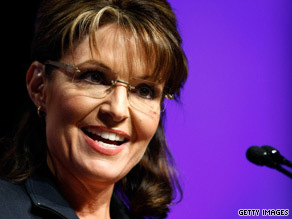 The Daily Caller reported Tuesday that Palin plans to “actively help” Angle, a favorite of Tea Party activists. Former Alaskan Gov. Sarah Palin fired back at critics Wednesday, a day after EMILY's List, a women's group of abortion-rights advocates, launched a campaign against her. Washington (CNN) - Former Alaskan Gov. Sarah Palin fired back at critics Wednesday, a day after EMILY's List, a women's group of abortion-rights advocates, launched a campaign against her. In a Facebook message on the women's suffrage movement posted Wednesday, Palin responded to the group's attacks, part of a campaign titled "Sarah Doesn't Speak for Me." "Unfortunately, I've recently come under attack for speaking up for sisters who seek to serve in public office," said Palin. "Regardless of whether the many candidates I've had the honor of endorsing win or lose this time around, I support them because they boldly shake things up in their primary races." 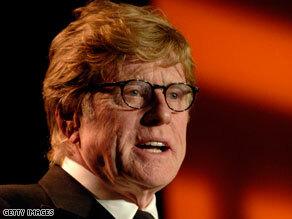 Robert Redford has penned a letter on behalf of Barbara Boxer. Washington (CNN) - Legendary Hollywood actor/director Robert Redford is the latest big gun being trotted out by the campaign of Sen. Barbara Boxer as part of her reelection effort. Supporters of the California Democrat received an email from Redford on Wednesday, complete with a fundraising plea. Focused on the environment, the letter praises Boxer's work on the issue. Boxer has "been there with us all along, long before cameras were rolling in the Gulf," Redford wrote, referencing the Gulf coast oil spill. "From day one, Barbara has been a champion for environmental protection in the U.S. Senate. Without her there to lead the fight, I fear that instead of learning the lessons of this moment and moving forward, we could find ourselves slipping backward," Redford says. Redford's letter heaps praise on Boxer while criticizing her Republican challenger Carly Fiorina over the same set of issues. The Republican National Committee is asking the Justice Department to investigate efforts last year by the White House to convince Rep. Joe Sestak to abandon his Senate campaign. 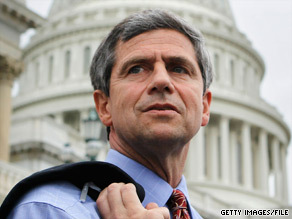 (CNN) – The Republican National Committee urged the Justice Department Wednesday to investigate efforts last year by the White House to convince Rep. Joe Sestak to abandon his Senate campaign, an attempt by the GOP to breathe new life into an embarrassing episode for the Obama administration. RNC Chairman Michael Steele made the request in a letter to Attorney General Eric Holder, a week after former President Clinton denied that he tried to convince Sestak to leave the Democratic primary at the behest of the White House. Clinton's account appears to contradict a White House internal investigation that was outlined in a publicly released May memorandum. Washington (CNN) - The Obama administration is preparing to announce new rules allowing some travel to Cuba, along with an expanded ability for Americans to send economic assistance, a senior U.S.official and congressional sources told CNN Wednesday. According to two congressional aides briefed informally on the plans, the administration is expected to announce "soon" that it will essentially reinstate measures that were in place under the Clinton administration. Both aides stressed the administration is still working through the details and legal language. 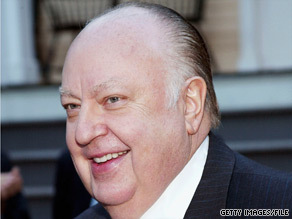 The Democratic Governors Association has written a letter to Fox News chairman Roger Ailes. (CNN) - With the knowledge that Fox News' parent company recently cut a $1 million check to the Republican Governors Association, the leader of the Democratic Governors Association is calling on the cable news network to run a "formal disclaimer" when it covers gubernatorial races. "I request that you add a formal disclaimer to your news coverage any time any of your programs cover governors or gubernatorial races between now and Election Day," DGA executive director Nathan Daschle wrote in the letter to Roger Ailes. "[…]If you do not add a disclaimer, I request that you and your staff members on the 'fair and balanced' side of the network demand that the contribution be returned." A CNN review of financial contributions made by media corporations showed that the parent companies of CNN, ABC, CBS and NBC have all made at least six-figure contributions to political parties and candidates. But none of them have given one organization so much money relative to its equivalent association on the other side of the aisle. 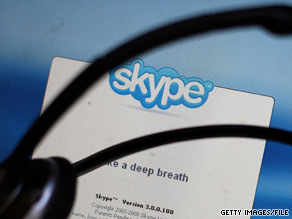 Lawmakers are prohibited from using Skype to chat from their offices. New York (CNNMoney.com) - Internet video-chatting service Skype helps connect people across the globe - but your representatives in Congress are banned from using it. House Democrats and Republicans have been tussling over whether to overhaul technology rules that prohibit lawmakers from using Skype to chat from their offices with the people they govern. Their obstacle: A 2006 ban on running peer-to-peer applications behind House and Senate firewalls. Such programs allow computers to share files (remember Napster? ), which could pose a security risk. Skype is a peer-to-peer (P2P) program, but its software is a different animal from the popular-with-pirates media swapping applications that gave the P2P field a reputation as the Internet's Wild West. While Skype users can send files directly to others, the company says it's impossible to share documents accidentally - as users could with file-sharing programs like LimeWire.